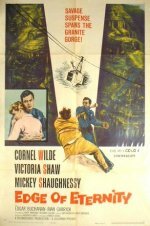 In this moderately exciting modern-day western, lawman Cornel Wilde pursues murderer Mickey Shaughnessy towards the Grand Canyon and a cable-car climax. The overall effect is marred only by some cheap back projection that looks horribly out of sync. Dirty Harry director Don Siegel does wonders with the low budget and short shooting schedule, but even he can't get a performance out of leading lady Victoria Shaw.